Spring has sprung at my house, and I couldn’t be happier. My human mommy and I have spent our ninth year together in the garden . . . weeding, trimming, digging, planting, and enjoying the fruits of our labor. 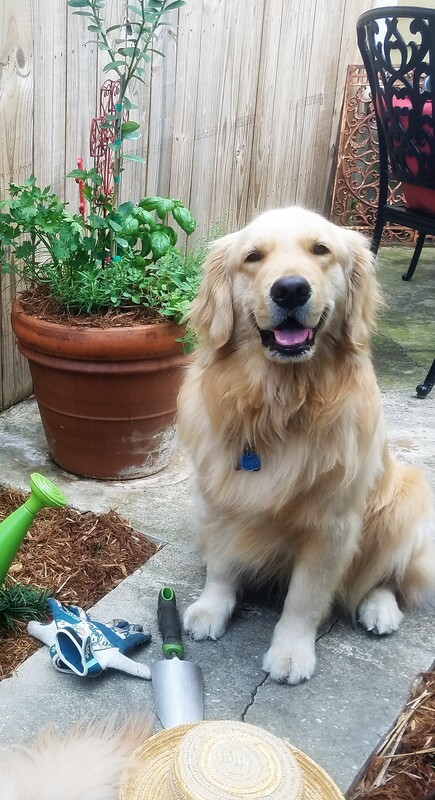 I’ve been Mommy’s Golden green thumb in the garden since I was just a tiny puppy. Before we moved to New Orleans, we had a really big garden. It took days and days and days and days to get it into shape. Our garden is smaller now–just a few pots and a little groundcover and mulching. In many ways, it’s a much simpler task . . .
. . . and in other ways, it’s more of a challenge. 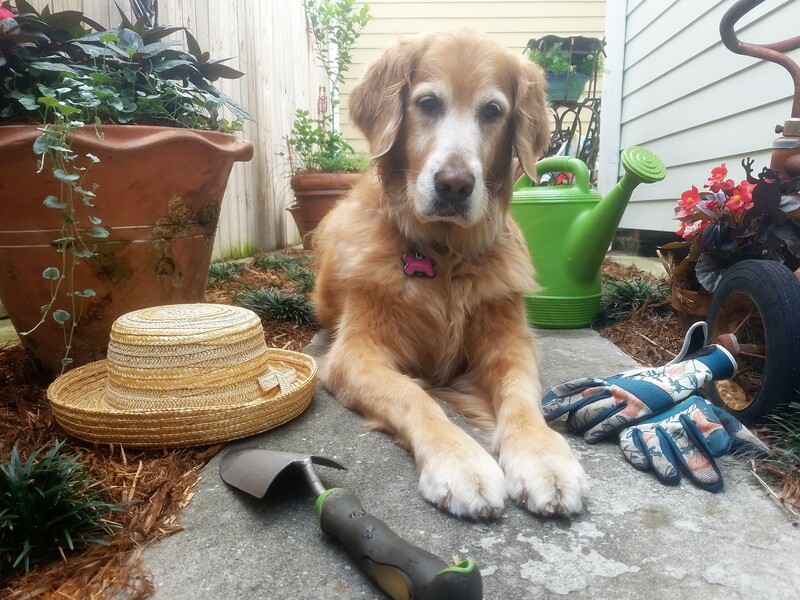 But I’ve been working closely with Tallulah to teach her the ropes and I think she has a bright and sunny future as a Golden gardening assistant. 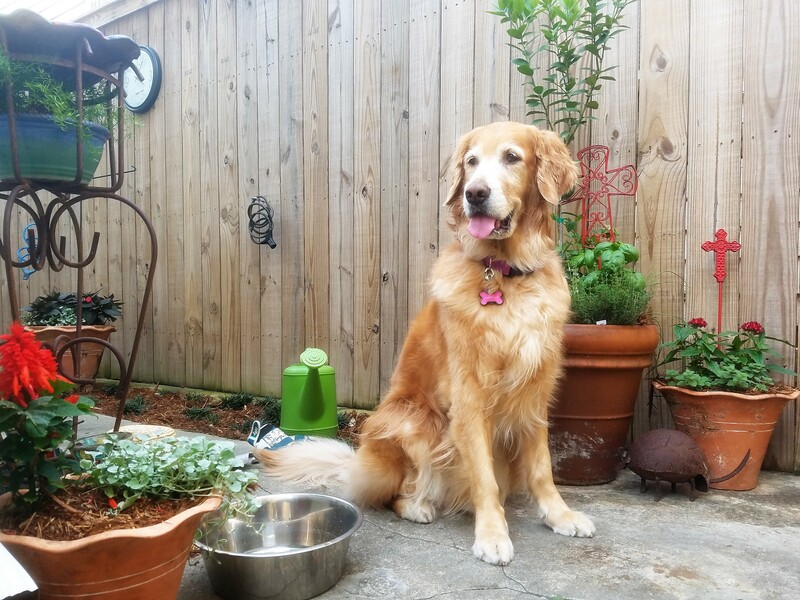 What’s better than one Golden in the garden? 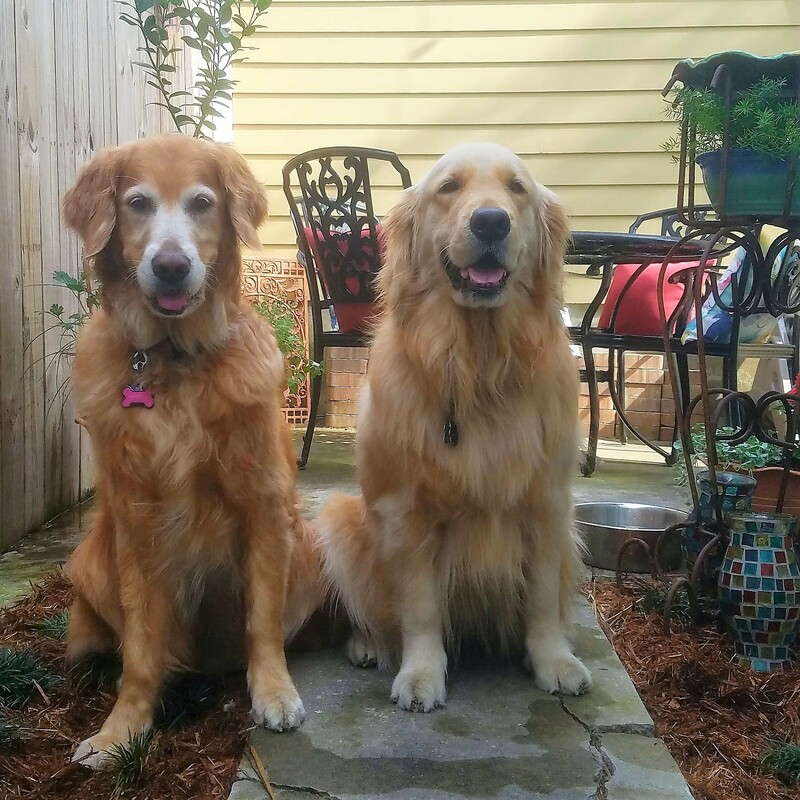 Two Goldens in the garden! 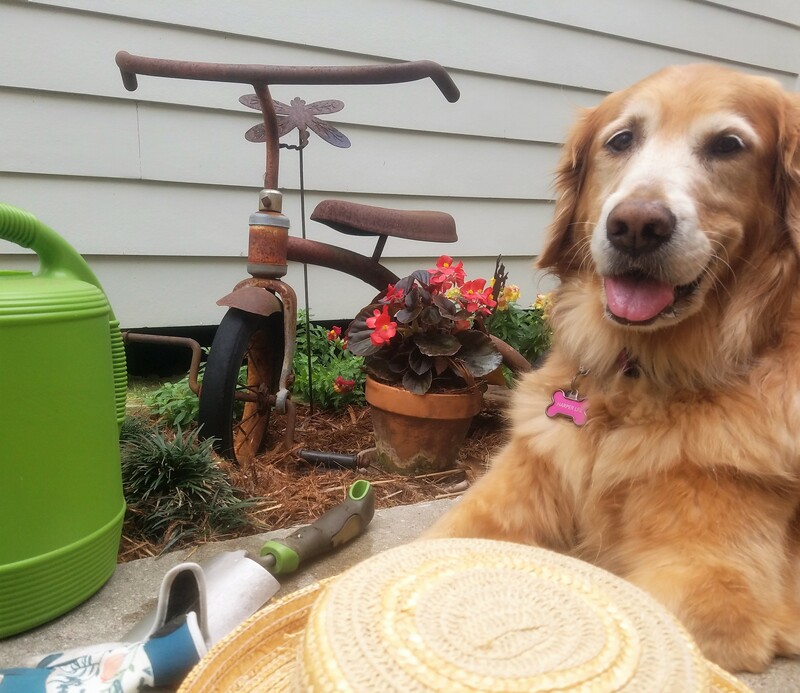 Tallulah and I wish you a very happy spring, filled with warm breezes and vibrant blooms. And we wish our human mommy a lifetime of Golden green thumbs in her spring garden. Happy spring! A note from Miss Harper Lee’s humans . 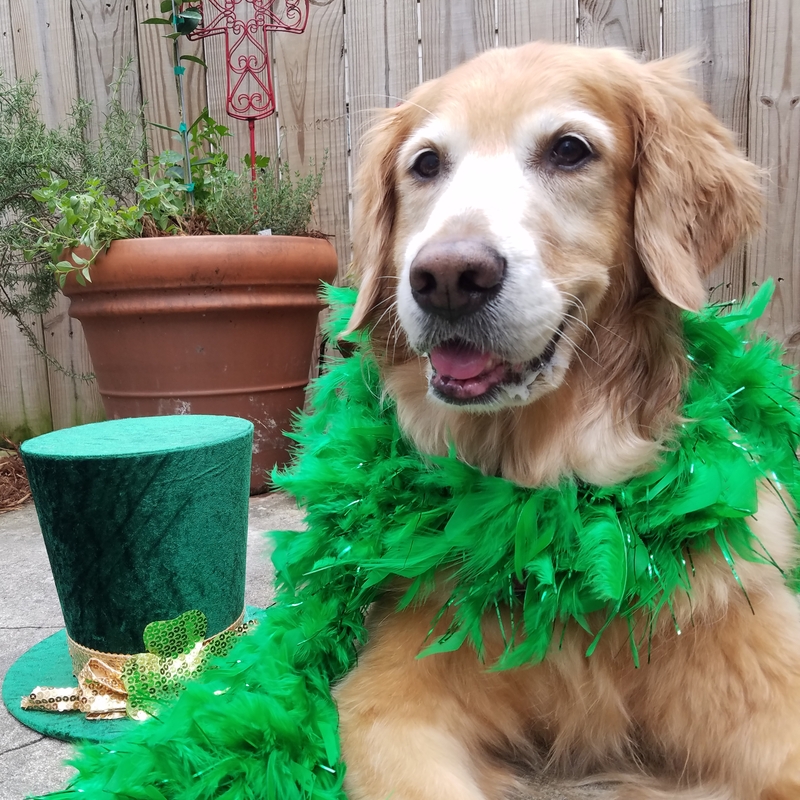 . .
We spent St. Patrick’s Day on Cloud Nine because today we celebrated Miss Harper Lee’s ninth birthday. We’re counting on a little luck of the Irish to bring us many more happy and healthy years with our sweet girl. Cheers to you, Miss Lee. You fill our home with joy and love and peace . . . and you mean more to us than we could ever express. It’s been a minute . . . or two . . . since I’ve seen you. 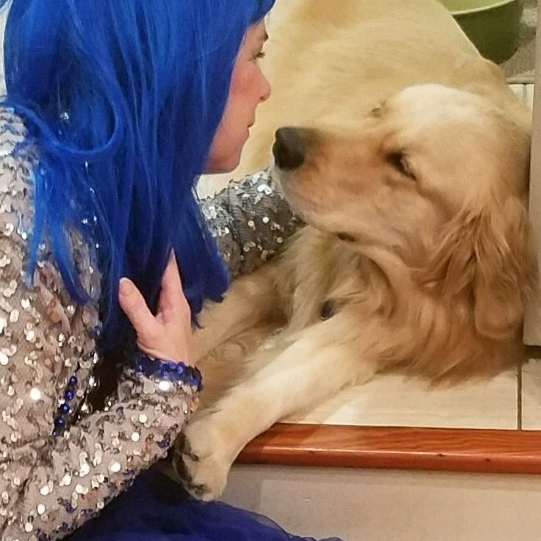 When last we visited, the new year had just begun and I shared those silly resolutions that my human mommy had for me. No worries; that foolishness didn’t last through the first week of 2018. So what in the world have I been doing for the past couple of months? Baby New Year played a cruel trick on us in early January with an unusually cold blast of Arctic air. Our lows dipped into the 20s for several nights in a row and the highs didn’t get above freezing. 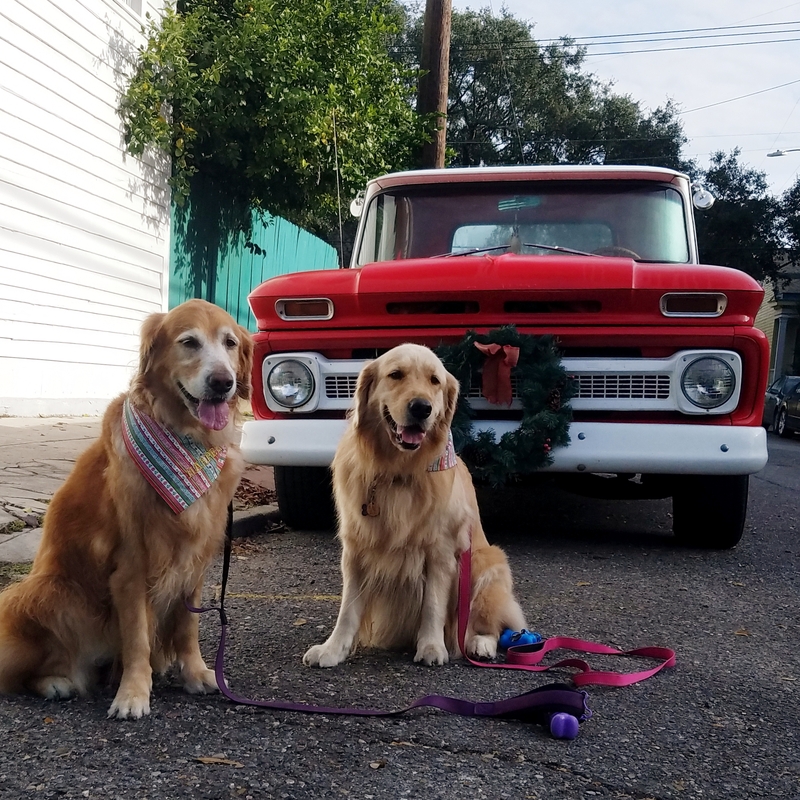 I know that doesn’t sound too impressive to my friends in colder climates, but for a couple of southern Golden girls living in New Orleans, Louisiana, it was pretty chilly. We had ice on the sidewalks and broken water pipes throughout the city. On the positive side, Tallulah and I were cordially invited by the humans to join them in their bed. 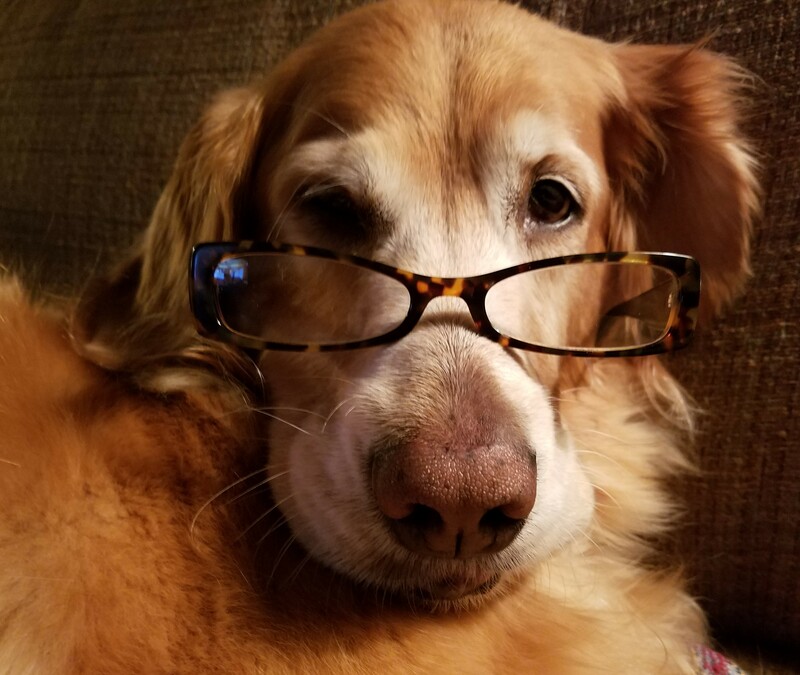 Turns out Golden Retrievers can be super heat generators and quite in demand during severe cold snaps. Fortunately, that cold snap didn’t last very long and by late January Tallulah and I were out on the town. 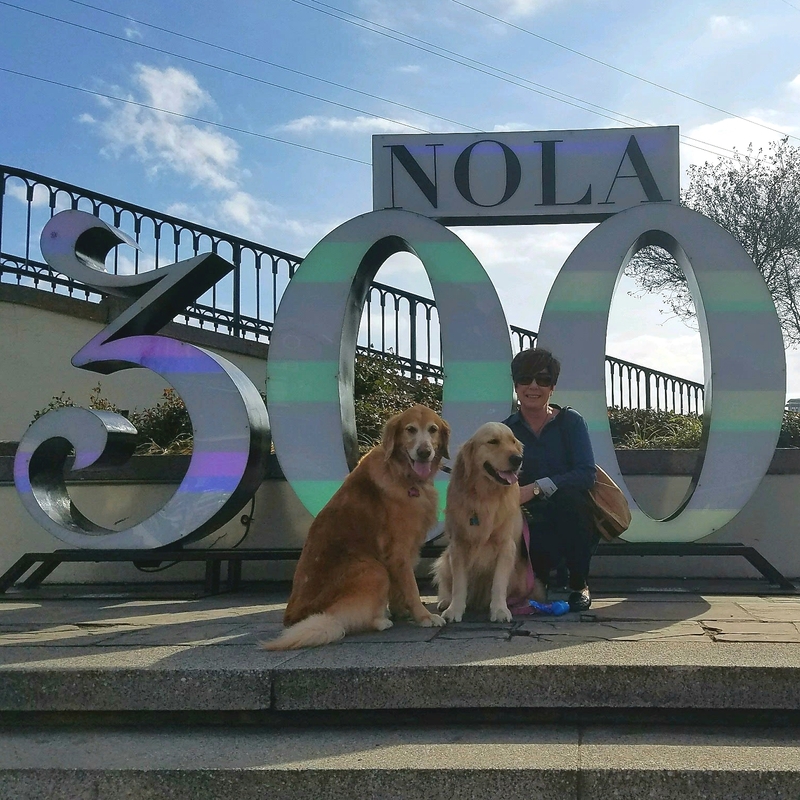 We joined the humans for a day in the French Quarter in honor of our city’s 300th birthday. 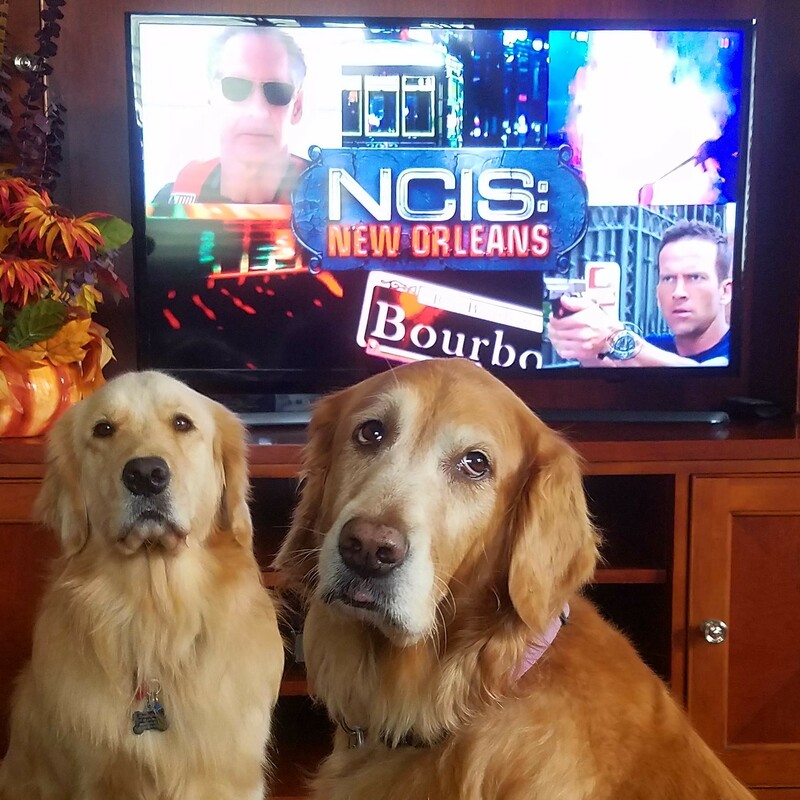 Here in New Orleans we love a party, so we’ll be celebrating throughout the year. 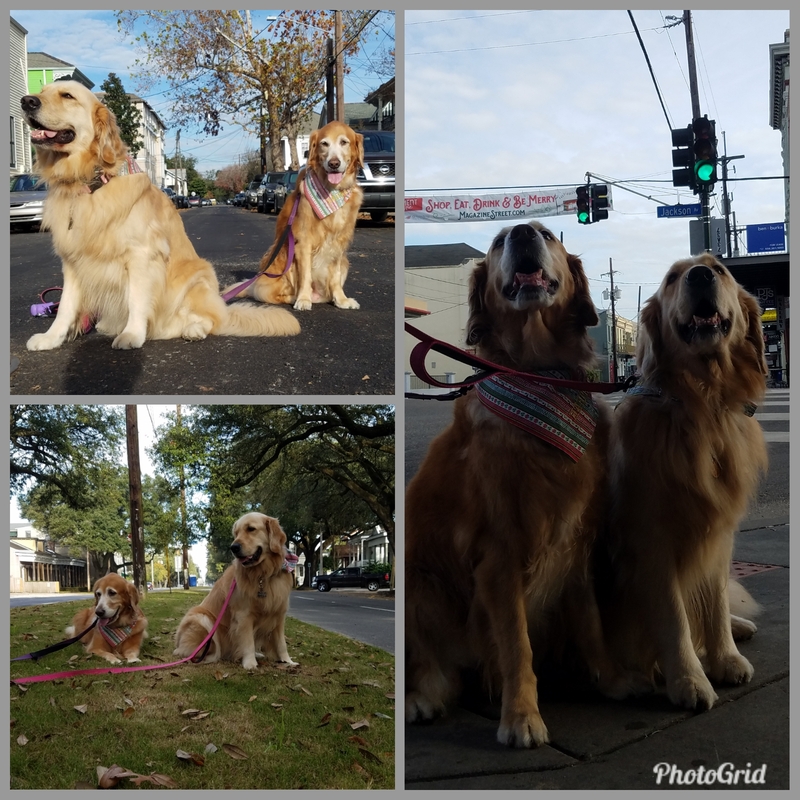 By early February, the humans were deep into Mardi Gras madness. We didn’t see them much. It seems like every time Tallulah and I woke up from a nap, they were headed out the door to another parade. And when we did see them, we hardly recognized them. It was just a blur of wigs, sequins, and beads. As soon as the last piece of king cake was consumed and all the Mardi Gras decorations were safely stored, the humans packed their bags and flew south . . . all the way to Hotel Punta Islita in Costa Rica. 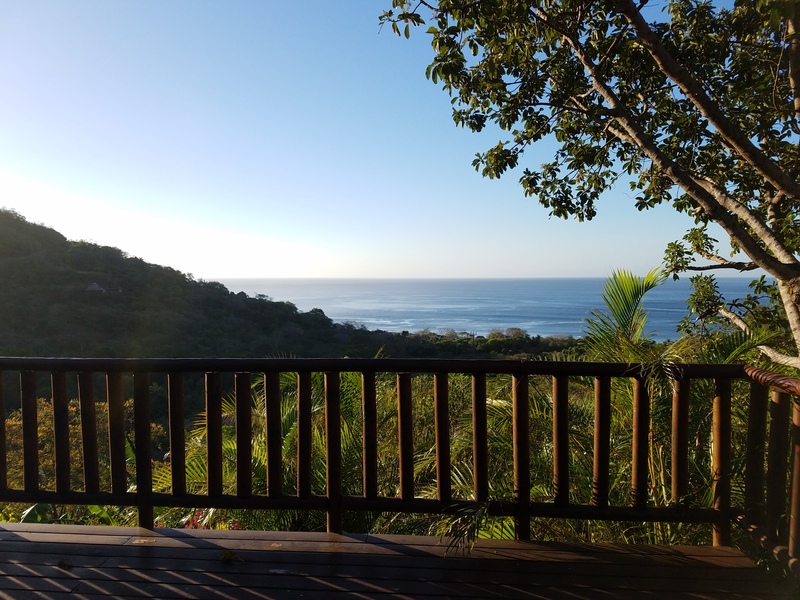 They awoke to this magnificent view every day, spent hours on the beach, kayaked to the ocean, learned about macaw rescue and howler monkey habits, and generally fell in love with the country and its people. 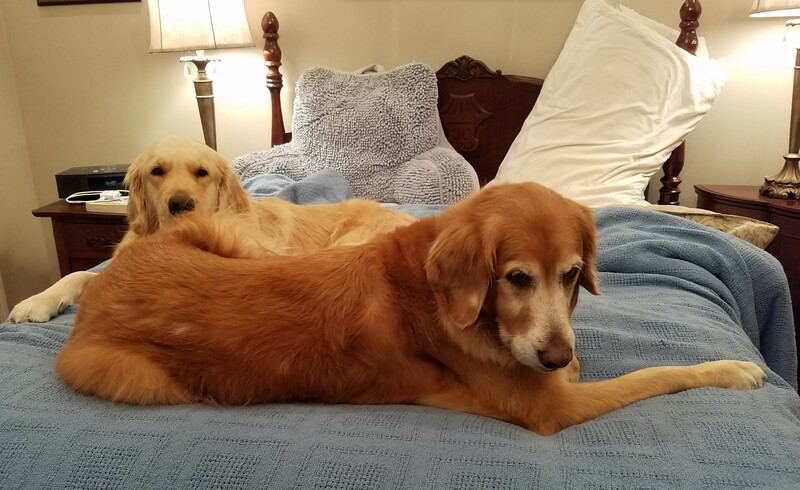 Mommy said the only thing that could possibly have made their trip better would have been a couple of Golden Retrievers. I’m assuming she meant Tallulah and me. The humans returned from their getaway just in time to join me at the my Visiting Pet Program annual meeting and picnic. My fellow volunteers and I devote the year to bringing love and leaving smiles at nursing facilities, hospitals, summer camps, universities, and conventions. 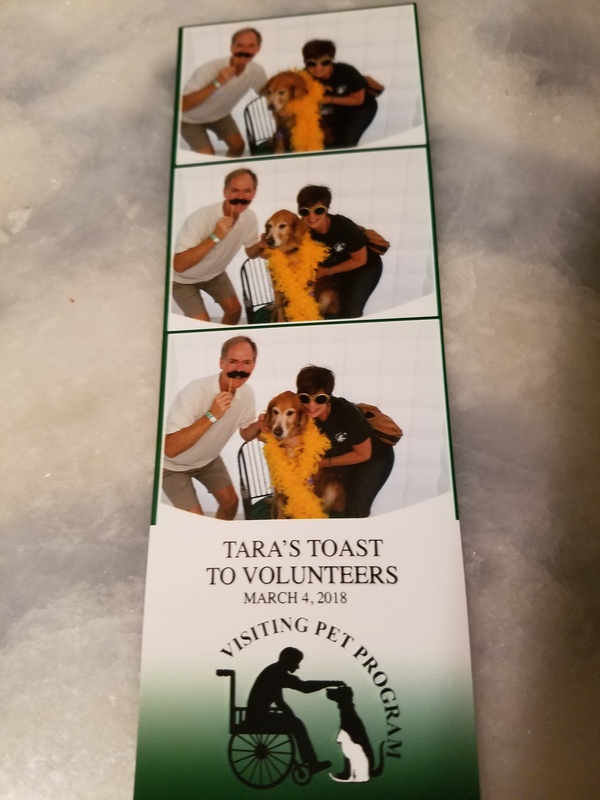 Tara’s Toast to Volunteers gives us an opportunity to celebrate the people and pets that make the program such a success. This year, we got to ham it up in a photo booth and visit with a pet psychic. 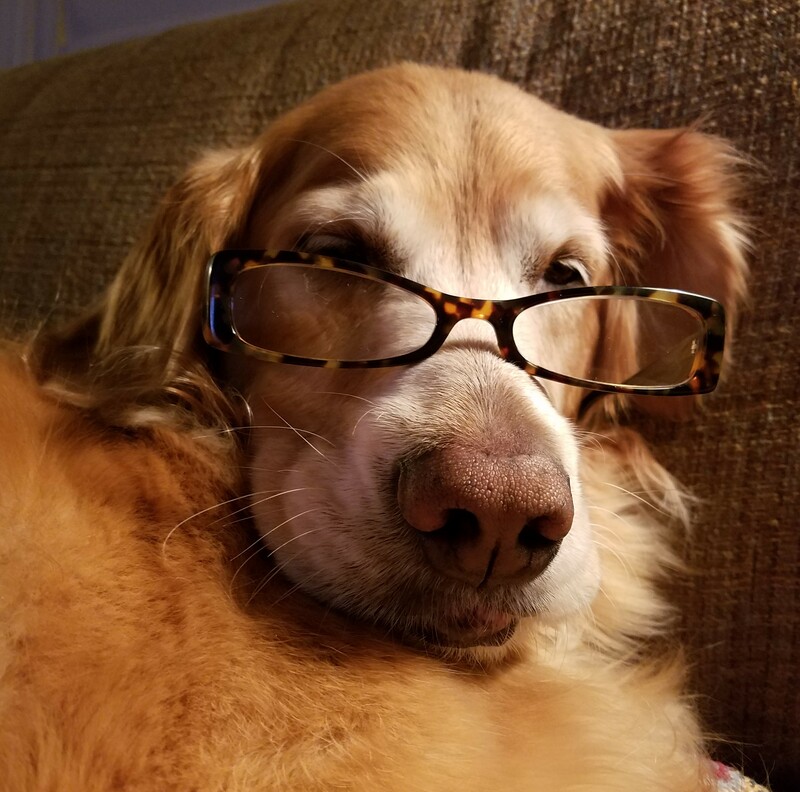 She told my humans that I’ve lived many lives, which has helped to make me very wise. I think she nailed it. So now you know what I’ve been doing. I’ve missed you, and I’m eager to catch up. What have you been doing? 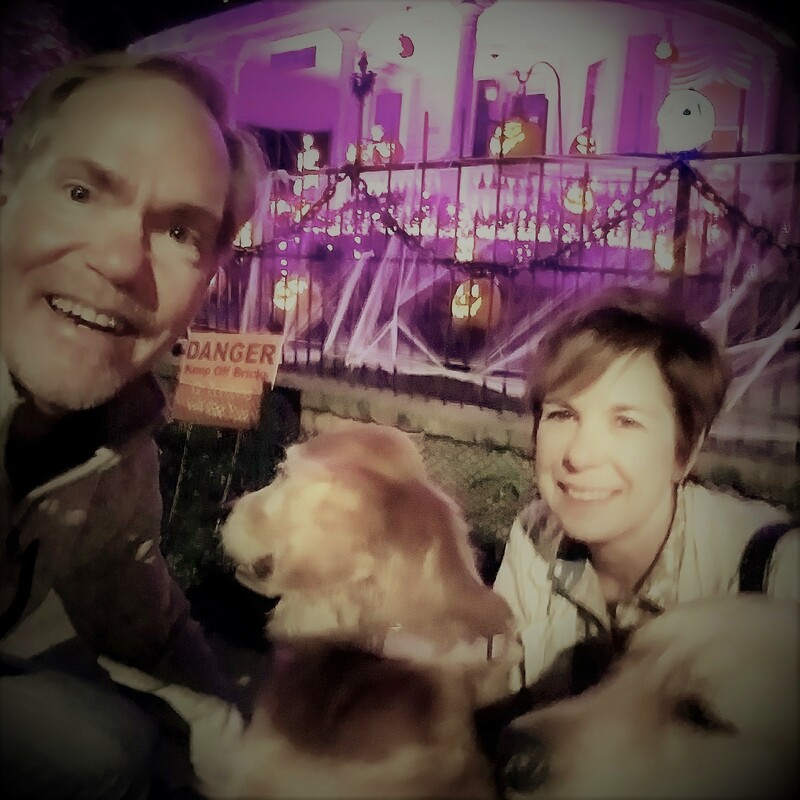 Last night, Tallulah and I accompanied our humans on a little stroll to see Ghost Manor. Let me take just a moment to state the obvious: My family really, really needs to step up its SELFIE game. Can you believe that we took literally dozens of selfies and this is the best we have to offer? This selfie is, as the kids would say, definitely not on fleek. But it got just a little embarrassing to continue the attempts as the crowds milled about, so this is what you get. Selfie failure aside, Ghost Manor at night was even better than I’d imagined when we visited a couple of weeks ago in the daytime. (Click here to refresh your memory.) The skeleton quartet serenaded us from the porch. A beautiful lady danced in an upstairs room . . . before she was consumed by flames. And all the while giant eyeballs peered down on us from above. Creepy! OK, friends, we really need your help. 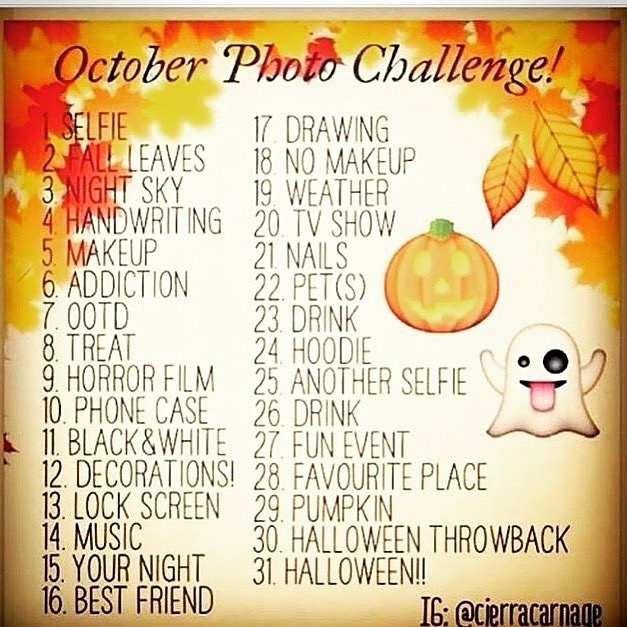 What are your best secrets to capturing the perfect selfie? I hope you have some super fun plans for the weekend. We’re expecting a rainy one . . . the perfect excuse to snuggle on the couch and catch up on a little television viewing. Cheers!